I mean, this doesn’t always happen, but it’s peculiar how often the same things that make a male fantasy character badass, dark, and fascinating are interpreted as fake deep, annoying, and “Mary Sue” if they’re applied to a female character. And if I may extend the concept a bit, some people judge others’ stories as overwritten, melodramatic, or heavy-handed when they aren’t able to see the same qualities in their own work. I have a fairy tale retelling in which the main character is practically a poster child for Mary Sue syndrome–but she’s basically SUPPOSED to be because she’s invoking an archetype that’s super popular in fairy tales. Some will appreciate how it fits together, and others will turn their noses up at the same thing and think it’s cheesy. It’s a risk you run when you write something deliberately derivative. Not to mention that writing about someone unusual, special, and extraordinary does not automatically make them a “Mary Sue”–it’s become such an overused term, wantonly slapped on lady characters every time they’re the most interesting character in the room. When their perfect warriors with painful pasts and hearts of gold make me yawn, I just don’t read them. Let ’em write what makes them happy. Huh. Well, we do have a double standard, but that cuts both ways, too. Then again, I was well into “Marty Stu! Marty Stu! WTF this doesn’t even make sense why would I read any of that crap? sheesh!” before panel 4, so the punchline was another “WTF?” but of a somewhat different kind. And again with the comment below that. 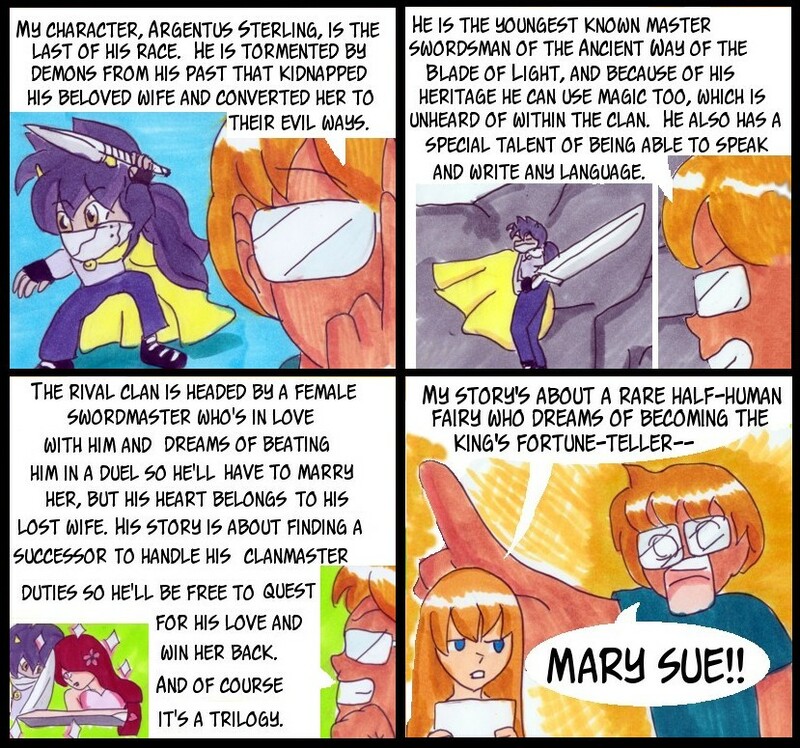 If I take a side-trip to tvtropes’ Mary Sue page it gets even more confused. Anyhow, might be a good idea to take a good hard look at the story anyway. Maybe your unkind commenters were merely being unkind, but maybe not, too. Oh, are you telling me to “look at” the story I’m referring to and consider whether maybe they’re right? I guess there’s always room for improvement but this story isn’t in edits–it’s the book that got me an agent. Sooo true. Oh god, it gets the most ridiculous when it’s inside the same story or universe that people are complaining about a female character’s supposed Mary Sue-ness, while simultaneously praising a male character for the same, or even more outstanding qualities.